There are no known badges of Hodson's Horse but irregular units raised in a hurry had a very relaxed attitude to uniform. This badge is based on the arms of the East India Company and was worn on the waist belt plate by any officers serving in the Company that did not have a regimental badge. The motto inscribed on the circlet reads: AUSPICIO REGIS ET SENATUS ANGLIAE. The wreath is of laurel and palm leaves. 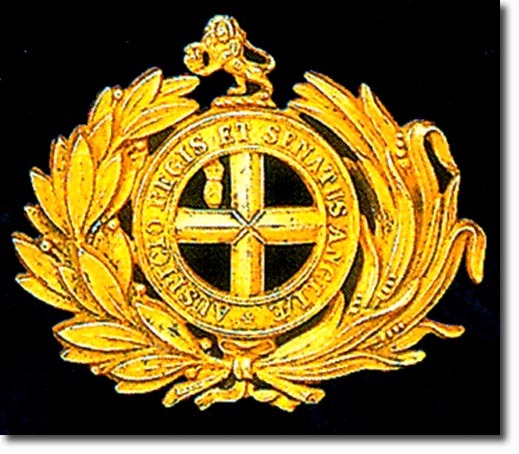 This badge would have been replaced after 1st Nov 1858 when the Indian Army was transferred from the Company to the Crown.